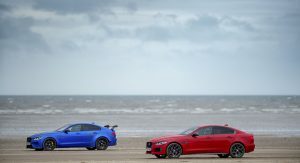 In creating the XE SV Project 8, Jaguar went far beyond what BMW does with its M3 or Mercedes does with the C63 and created a completely bonkers hot rod of a performance sedan. 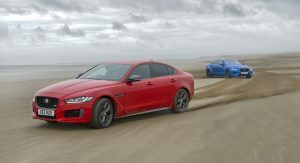 But the British automaker wants you to know that even the more accessible versions of the XE share common DNA with the extreme performance machine. 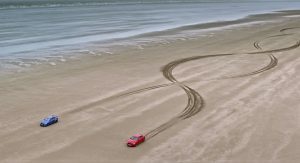 So it took examples of both to the shores of Pendine Sands and ran them down the beach for this promo clip. 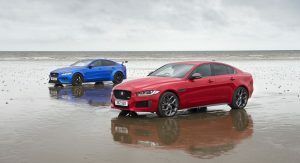 Alongside the Project 8 is the XE 300 Sport, which isn’t even the next most potent version. That’d be the XE S with the 3.0-liter supercharged V8 kicking out 375 horsepower (279 kW) and 332 lb-ft (450 Nm) of torque. 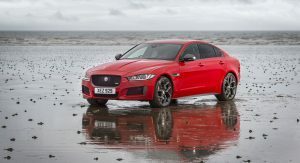 The XE 300 Sport instead adopts an amped-up version of Jaguar’s Ingenium engine: a 2.0-liter turbo four sending 296 hp (221 kW) and 295 lb-ft (400 Nm) to all four wheels. That’s about half the engine as the one propelling the SV version, with its 5.0-liter supercharged V8 tuned to 592 hp (441 kW) and 516 lb-ft (700 Nm). 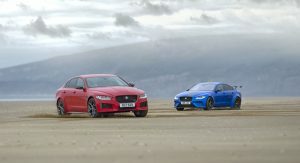 So where the eight-cylinder SV will hit 60 in 3.3 seconds and top out at 200 mph, the six-cylinder XE S takes 4.8 seconds to hit 62 mph (100 km/h), and the XE 300 Sport takes 5.7. Still, they share the same essential architecture. 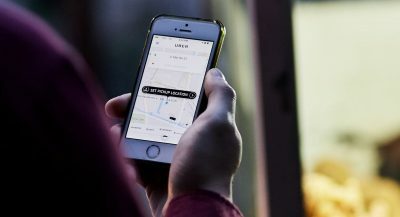 And from the video below, we’re lead to believe they share the same sporting character – even if they don’t return the same level of performance. Now if we could only get an XE SV with the force-fed V8 in a (relatively) more accessible form, we’d be all set – and its rivals at BMW M and Mercedes-AMG might have something relevant to worry about. Get back to us in a year after the salt water has turned these two cars into a pile of rust. The D7a architecture that the XE comes off is aluminium. Good to know. Though salt water will reek havoc on any metal that isn’t aluminum. A year? Optimistic for a Jaaaag. 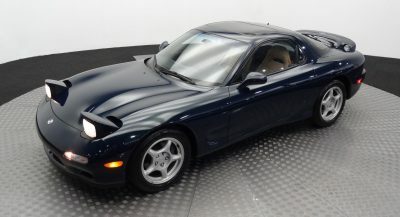 Would much rather have one of these than the BMW 330i.